I had a voucher for a free pair of glasses, only the voucher only covered the most basic plastic lens. Considering I am twice legally blind without corrective eye wear, basic plastic lenses in my prescription are comically thick. Not to be one to pass up on free glasses I decided to not only get the basic plastic lens of ridiculous thickness, I also decided to find the most ridiculous frame possible to encase the comically large pieces of plastic. I picked the most outrageous pair of glasses I could find on purpose. They are giant, round, plastic and purple with silver hearts at the temples. I wear silly glasses on purpose. They are the most comfortable well working pair of glasses I have ever owned and I love them. the one where the average girl attends the greatest spectacle in racing. Awesome! Love how you used the freebies to your advantage! @pgoodness, The optician in you is probably dying a little inside. @Beth, There was a girl in Canada who had GLITTER GLASSES. @Casey, Leave it to Toronto to have the best specs! Glitter must have been awesome!! Oh, darling, they’re DIVINE! I recently watched that Gloria Steinem doc on HBO and the eyewear was so LARGE and in CHARGE and GLORIOUS like this. Mind telling us where you got ‘em? @Jenn, Large, in charge and free. Heh. I’ll be Gloria’s were slightly more. And this is why I’ve always been jealous of people with bad eyes – the ability to accessorize your eyes! NO FAIR! @ClassyFabSarah, But you can buy fake ones at Claire’s for $5! I want them, and I want them NOW!!! First, I love purple. Second, I have been trying to find HUGE ala ’80′s frames well, since the 80′s!! I too have a strong prescription and now add bifocals and those stupid super small lenses just don’t cut it. Would you be so kind as to email me the make and model? Thx.!! 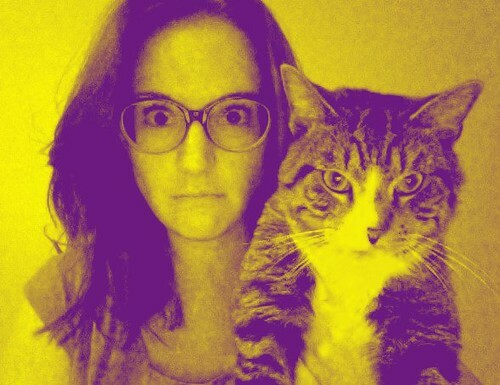 @Lee Laughlin, We must take photos together in our old lady glasses. LOL That cat does not look like he/she is thrilled at all to have its photo taken for the entire world to gawk over. I also have a voucher for FREE glasses also. I am just legally blind but, alas my lens are also thick – oh and add me some bifocals also! Oh yeah baby!!! I wonder if I shouldn’t go get me some outrageous ultra groovy specs also? mmm I will get back to you on that! @Shari, I’m beginning to realize that Percy looks really grumpy pretty much all of the time, one of those faces. *snort* HA! Those are amazing! So funnny. MEOW!! @Jessica V., I wish I could have put glasses on him. love them! i recently did the same thing – i got the most hipster round glasses and love how ridiculous they look. i have the same problem with the Rx strength, so i figure the thick frames disguise most of the lenses anyway! p.s. what is considered legally blind? i’ve always wondered but can’t find a concrete answer on google! oh dear – i’m -7 in one eye in glasses and -6 in contacts. even lasik can’t help me now. Pretty sure I had that same pair, minus the hearts, when I was 8 and they were the coolest glasses I had ever seen. So you’re not silly, you are the height of 8 year old style and glamour and you ROCK those specs! @Joules, Oh man, my eight year old glasses were TRAGIC. Blue speckled metal, and HUGE. You rock those glasses. I’m just sayin’. @lceel, I’m currently wearing them AND footed pajamas with penguins on the toes. I like them, but you look like a total hipster. Actually, those glasses somehow look CUTE on you! @Carolyn, It’s because your grandma probably wears the same ones, I know mine does. Close up of the hearts please and thank you! And p.s. You look pretty awesome in them! @Shan, Heh. I’m not sure how to do such a thing but I’ll figure it out! Oh those are completely fabulous! @tracy@sellabitmum, Oh thank you darling. The glasses. The cats. Love it all! @suzanne @ pretty swell, I’m pretty happy with my life decisions. Except for dinner tonight. Meh. I don’t know… I kind like them for reals. I seriously need to get my eyes checked. Um… wait. Not that I meant I had to get my eyes checked BECAUSE I like the glasses. Totally different thoughts. @Colleen, Whatever, you want dorky glasses too. I completely endorse wearing goofy glasses on purpose. I save being ironic for everything else. @Arianne, Ah yes! I thought of you when I put them on and decided to OWN THEM. Two: I can’t wait for big glasses to come back in. These little teeny glasses are actually super limiting in terms of peripheral vision. A great big lens would mean I can see everywhere, not just around the limit of these stupid teeny fashionable lenses. Three: To that end, I bought a pair of big prescription sunglasses. However, whenever I wear them they freak me out because it seems like the floor is deeper than it should be. Is this a normal phenomenon with big glasses? Go, put them on and look at the floor and report back. @zchamu, I nearly fall down the last step EVERY TIME. Glad to know it’s not just me. But the peripheral vision IS AMAZING. I got silly glasses on purpose, too. The year I wore them was the most fun I’ve had in a while. 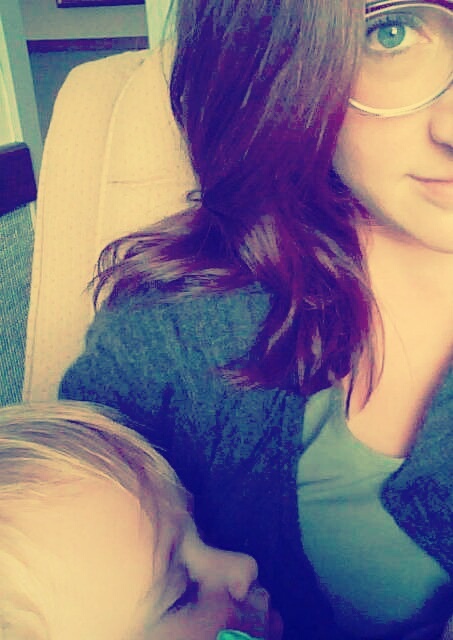 The latest glasses I got are more boring, and I miss my giant, ridiculous frames. You’ve inspired me to get a new pair.